24 by 200m (200m rec) at CR South Track by run10k31 at Garmin Connect – Details. So today’s workout was 24 by 200m at HM pace. This morning was pouring and I have not been getting enough sleep so I bagged the 6:30 am idea hoping that Aaron’s 9:00am soccer game would be rained out. I quickly checked the iPhone early and once I saw it was rained out I took to the opportunity to get a bit more sleep. I think that may help helped a bit. I got up and headed over to the track mid morning. It had just rained but was still quite humid out. That said expect for the track having some water on it, the rain had stopped and running conditions were not that bad. 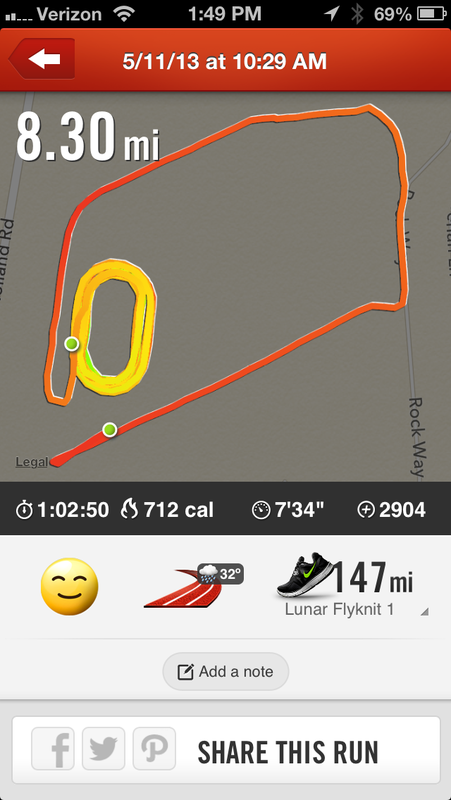 Although there was a CYO track workout it was over by the time I was done my warmup so I mostly had the track to myself. I started the interval and ran the first one in a effort that I thought might be slow. 38.. Good that was faster than my 5K pace so I was happy. I settled into 40s for each which is 5:20 pace so this ended up being a 5K pace workout but it felt very easy so I am happy with that. I was drenched when done due to the humidity but otherwise felt really good. Even the last one which I ran in 35 felt like a strider. The only issue with today was my Gamin 610 decided to not charge (or backwards charge actually). This happens every so often and requires me to clean the connection on both the watch and the charger. Since I did not have time to wait for the 610 to charge I borrowed my wife’s Garmin 210 which worked quite well until I tried to download the data. I found out that particular device has an issue downloading data to a MAC. you need to align the clip just right on the watch or the MAC will not detect it. Apparently this is also a common problem as a Google of this issue comes up with many results. After 30 minutes of messing with it I finally got the data to download. URGH!